There is a 1 Gallon, 2.5 Gallon, & 5 Gallon BIG WITCH! What is a Weed Wtich, what does it let you do and how will it help your hobbyist or commercial production? A weed witch stated simply is a reflux still which allows reclamation and production of Ethanol. Ethanol is the most expensive part of Marijuana oil production. The Weed Witch allows you to reclaim 90% of your Ethanol while making Alcohol Cannabis Oil. This cuts your production costs by a large amount. This is especially true, when you get the $1000.00 30 gallon Ethanol Still upgrade to your 2.5 or 5 Gallon Big Witch. 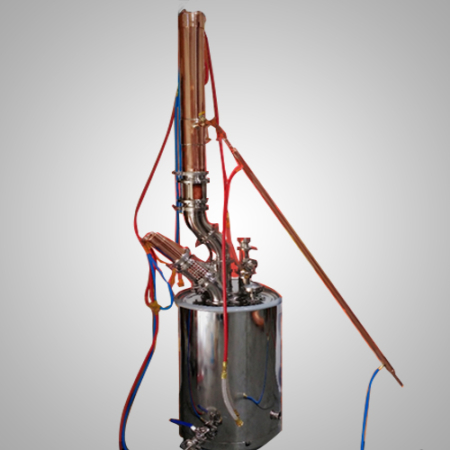 This lets you produce your own high proof Ethanol, then reclaim it, all in one unit. The product you can produce with our system is comparable to Rick Simpson Oil, but is typically able to reach higher total cannabanoid count. The product is great as an alternative to BHO, and is a no pressure system so you don’t face the dangers present in C02 extraction. If you want a reliable production unit, for making Cannabis Extracts from vape, tincture, to shatter this is the system for you. You can even get honey oil with the addition of a short path distiller. Similar lab grade equipment can cost tens of thousands of dollars. Our unit, is made economically and built to last. 1 45 degree thermometer,hoses, 1 extra large funnel. Stainless steel boiling chamber including stainless steel dome. Distiller Output: 12 Gallons/day if run continuous. Cannabis Material gram weight.Base Size: 8 in. (20cm) width X 14 1/4 in. (36cm) hght. Tower is 26in. Water Cooled condenser and Tower: Cold input, Hot output. Standard Garden Hose Fitting. Capacity: 4 L.(1 gal. ethanol 170-200 proof) per 2 hours. Shipping $50 domestically. Local Delivery on case by case with fee. Consulting and set up on case by case basis with fee. We can do 60% down and 40% before we ship. We offer a free phone consultation (971-232-0895) to answer all your needs regarding set up, and all peripherals you may need from hobbyist to large scale commercial production. Comes with 3″ tower, five foot liebig condenser, 3x 1500 Watt elements, 30 Gallon Outer Pot, 2.5 Gallon Inner Pot. This is a double boiler system that helps encourage even heating and prevent scorching. 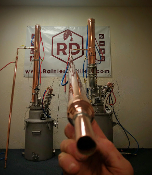 Turn your unit into a 30 Gallon Ethanol Still for $1000.00. Stainless Steel Pot, Copper Tower. Distiller Output: 36 Gallons/day if run continuous. ACO Output: Up to 1/2 Lb per gallon ethanol 170-200 proof, ACO output can yield up to 20% of Cannabis Material gram weight.Base Size: 21in wide. 29in tall Tower height 54in. Water Cooled condenser and Tower: 3 Cold inputs, 3 Hot outputs. Standard Garden Hose Fittings. Capacity: 6 L.(1.5 gal. ethanol 170-200 proof) per 1 hour. Shipping $350 domestically. Local Delivery on case by case with fee. Consulting and set up on case by case basis with fee. Comes with 4″ tower, five foot liebig condenser, 3x 1500 Watt elements, 30 Gallon Outer Pot, 5 Gallon Inner Pot. This is a double boiler system that helps encourage even heating and prevent scorching. Distiller Output: 72 Gallons/day if run continuous. ACO Output: Up to 1/2 Lb per gallon ethanol 170-200 proof, ACO output can yield up to 20% of Cannabis Material gram weight. Base Size: 21in wide. 29in tall Tower height 54in. Capacity: 12 L.(3 gal. ethanol 170-200 proof) per 1 hour. We can offer custom size stills to suite commercial growers, price negotiable! * All products are custom made, if a refund is requested before completion, we will refund 70% of total unit cost for material and labor costs. Allow 4-6 weeks for production.